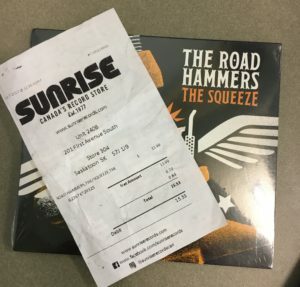 If it seems like Sunrise came of out of nowhere, it’s because they did. An independent record store since 1977, Sunrise Records was purchased by Doug Putnam in 2014. Putnam comes from a family operated toy and game manufacturing business based out of Ontario called Everest Toys. When Putnam purchased the chain of record stores, the previous owner had shuttered many stores already laying blame on higher rents. Putnam not only believed in the value of physical music sales, but he was able to rejuvenate the brand. Sunrise Records expanded back up to nine locations before the HMV opportunity arose. They have absorbed 70 locations across Canada including two in Regina and two in Saskatoon. Putnam has stated the part of the plan to make the acquired locations viable was renegotiating rental rates and other terms. With almost all of the vacated HMV locations situated in enclosed shopping malls, it would appear landlords are willing to take a gamble on this plucky independent brand. Partly because the trending departure of retailers from traditional malls has forced them to make riskier choices. Despite streaming services taking out a large chunk of the consumer base for music, there does appear to be a movement back to physically owning music. Records in particular are making a serious comeback. Putnam believes there is a desire among younger buyers to own classic or best selling albums, with the business less slanted to the top forty hitmakers. The record store has also evolved. HMV saw this coming and tried to incorporate other types of merchandise to supplement the music trade, but they may have been too late on the curve. Having bought my first disc last week at the Midtown location in Saskatoon, I am optimistic that they are on the right track. Friendly staff inquired whether my first visit met my needs, and call me crazy, but their sincerity took me back to a nostalgic time when my life revolved around visits to these stores. The thrill of peeling the cellophane back and cranking on the fresh hits was still there even if I still listen to my Apple Music every day. You just can’t beat a good tune!